The Bahama pintail or white-cheeked pintail (Anas bahamensis Linnaeus, 1758) is a simple but very pretty duck belonging to the order of the Anseriforms (Anseriformes), to the family of the Anatids (Anatidae), to the vast genus Anas and to the species Anas bahamensis. The species counts three subspecies: Anas bahamensis bahamensis Linnaeus, 1758, which is the nominal species and is the true “Bahamian white-cheeked pintail”, Anas bahamensis galapagensis Ridgway, 1890, which is the “Galapagos white-cheeked pintail” and Anas bahamensis rubrirostris Vielliot, 1816, which is the “South American greater Bahama pintail”. The name of the genus Anas comes from the Latin terms “anas, anatis”, tout court meaning “duck”; the term indicating the species “bahamensis” refers to the distribution range of the nominal subspecies at the level of the greater and lesser Antilles and, rightly, the Bahamas. The species, with the three different and spaced apart subspecies, is amply but irregularly distributed in northern South America and in the islands of the Greater and Lesser Antilles and of the Caribbean; irregularly present in Florida and USA (Anas bahamensis bahamensis). It is also present in a vast central belt of South America: from eastern Bolivia and from southern Brazil to Uruguay and Argentina and, occasionally, on the Falkland Islands (Anas bahamensis rubrirostris) and in the Galapagos Islands (Anas bahamensis galapagensis). These ducks tend to hide deep in the dense vegetation. Small groups may gather in brackish waters, in swampy areas or, subject to the variations of the water in connection with the tide, in coves, estuaries, mudflats and at times in locations with salt water. 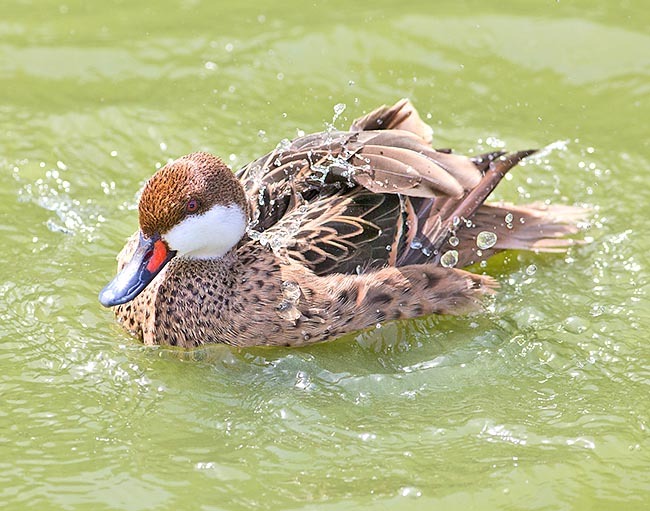 The white-cheeked pintail frequents also inland fresh waters such as the Amazon Basin where can be predated by big fishes like the arapaima (Arapaima gigas). Small duck with slender structure; has a length of about 38-51 cm, weight around the 470-535 g and wingspan around the 55-68 cm. The white-cheeked pintail is so called due to the ample white cheek spots contrasting with the rest of the head (front, vertex and back neck of dark brown) and of the body (mainly always dark brown). This distinctive white spot starts from the beginning of the beak (but in the dorsal portion) and goes on under the eye curving towards the under-throat and prolonging, for a short tract, at the level of the beginning of the ventral neck forming one unique spot extending at he level of both cheeks. The body, as we previously said, is brown maroon-brown, warm and intense, and spotted of very dark brown-black. The back is homogenously darker. A green iridescent bordered of black speculum is present, “inserted” in a zone of the wings where the surrounding colouration, the speculum itself, is coffee-light-cinnamon coloured. The tail is characterized by having pointed rectrices of pale brown colour shaded in grey-whitish dorsally and entirely pale grey-whitish ventrally. Overall, the tail has a colouration differing from the rest of the livery like a sort of a “clear brushstroke”. The bill is bluish grey in the dorsal and distal parts, laterally blackish with an evident red-carmine-orange spot at the level of the base of the upper rhamphotheca and extending for less than half of the bill (passing under the nostril); this coloured spot goes towards the dorsal junction of the bill ending rounded in both directions. The iris is dark brown and the eye is little evident as it “disappears” in the brown portion of the head where it is located. The legs are grey with yellowish shades. Unlike the other species of (Nordic) pintails, the eclipse livery is absent and the colouration of the plumage s the same all over the year. The sexes are similar, but the females are usually smaller, have a duller livery, duller are also the bills, have shorter tail (even if identically pointed). Young are similar to females abut are duller and have less iridescent specula. The South American subspecies (Anas bahamensis rubrirostris) is bigger and has a slightly more luminous livery than the nominal subspecies (Anas bahamensis bahamensis). The southern subspecies (Anas bahamensis rubrirostris), as we said, is bigger and has a more luminous livery than the other two subspecies and even if mainly living in tropical plain areas it is found regularly at about 2500 metres of altitude in Bolivia and a specimen has been sighted at more than 4000 metres in Peru. The Galapagos white-cheeked pintail (Anas bahamensis galapagensis ) is the smallest of the three subspecies and has the white of the cheeks and the throat less defined and less white; also the bill has less intensity than the other two subspecies. The Galapagos white-cheeked pintail is the only endemic duck of these enchanting islands where it appears as a very confident animal. 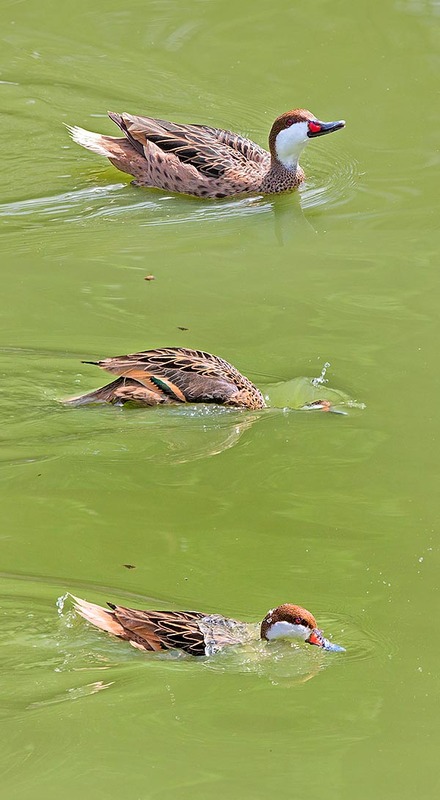 Even if the Galapagos Islands are more than 3 million of years old, it is thought that the ducks have become resident differentiating about 10.000 years ago after the appearance of humid zones suitable for their sustenance. 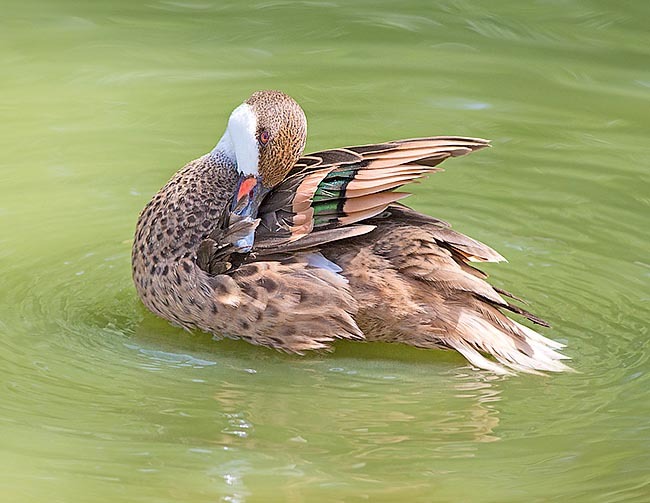 Even if the white-cheeked pintail does not have vagrant habits, the subspecies rubrostris has dispersive behaviours once the reproductive season is over. These ducks have a flight typical of the pintails, fast and agile. This pintail carries on solitary life, of pair, or in small groups; much numerous flocks are, on the contrary, fairly rare and occasional when the food abounds. The males of this species vocalize emitting low whistles and sounds similar to squeaks; the females, conversely, emit weak, but repeated, “qua-quack”. The white-cheeked pintails nourish in shallow waters immersing the head and the neck and assuming vertical postures. The diet is mainly formed by vegetal material like grasses, seeds, buds, leaves and stems of aquatic and marshy plants; this diet foresees the integration with aliments of animal origin, mostly aquatic invertebrates. The reproductive season is quite variable and is more linked to the presence and the levels of the water than to the seasonality. This duck establishes pair bonds rather strong but with variable and unsure duration behaving as “non rigid monogamous” with, in fact, many exceptions. The nest is usually placed on the ground, between the dense vegetation or among the roots of the trees, close to the water. The hatching is generally formed by 5-12 white-cream/leather coloured eggs. The eggs are incubated, for about 25 days, by the female only. The ducklings have brown upper parts with yellowish spots, the lower ones are almost yellow; yellow head with vertex and line crossing the eye brown as well as the auricular spots. The males, sometimes, accompany the females with the hatchings but most probably are not involved in the care of the ducklings. After their birth, the ducklings are taken to the safe in water where they are able to immerse for escaping the predators. At times, more hatchings are gathered to form bigger “hatchings type nurseries”. The young are completely feathered when 45-60 days old and van reproduce when one. Although the species does present an “uneven” distribution, the two subspecies with “wide distribution” are still now fairly abundant. The species has however remarkably reduced in a series of Caribbean island due to the excessive hunting pressure and the introduction of allochthonous predating mammals which in particular destroy the hatchings. 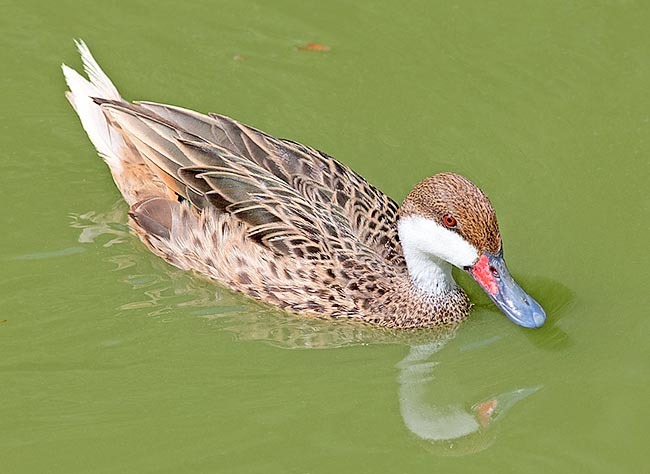 The white-cheeked pintail is abundant in Brazil and Argentina. The Galapagos subspecies, already scarce due to the fact of living in a restricted territory, suffers also the negative action determined by the tourism and by the introduction of allochthonous predatory mammals. The white-cheeked pintail, better known as “Bahamian pintail”, is diffused amongst the amateurish breeders which, maybe, underestimate it a little. Hardly, the bred specimens are genetically pure being of hybrid origin between the two supspecies bahamensis and rubrirostris. The aviculturists have selected a leucistic form with pale grey livery called “Silver Bahama pintail” which has abundantly diffused in captivity (there are also other less diffused mutations). The Galapagos subspecies has been rarely kept in captivity; some result has been obtained by German breeders. This duck, elegant, pretty and unobtrusive, may have a life expectancy of about 14 years.